Lyra is subsequently thrown into the nomadic world of the boat dwelling Gyptians - Ma Costa (Anne-Marie Duff), Farder Coram (James Cosmo), John Faa (Lucien Msamati), Raymond Van Geritt (Mat Fraser), Jack Verhoeven (Geoff Bell) and Benjamin de Ruyter (Simon Manyonda) who take her North in her quest. 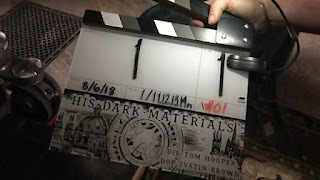 His Dark Materials is one of the supreme works of imaginative fiction for both children and adults published in the 20th century. After series one, which covers the first instalment of Northern Lights, the story continues in The Subtle Knife where Lyra is joined on her journey by Will, a boy who possesses a knife that can cut windows between worlds. As Lyra learns the truth about her parents and her prophesied destiny, the two young people are caught up in a war against celestial powers that ranges across many worlds and leads to a thrilling conclusion in The Amber Spyglass. His Dark Materials has been published in more than 40 languages and has sold worldwide close to 18 million copies. Since first publication in 1995 of Northern Lights, the three books have been acclaimed worldwide and have won many awards. In 2001 The Amber Spyglass was the first and only children’s book to win the Whitbread (now Costa) Book of the Year Award, in 2007 Northern Lights won the Carnegie of Carnegies and in 2005 Pullman was awarded by the Swedish Arts Council, the children’s literature equivalent of the Nobel Prize, The Astrid Lindgren Memorial Award. Tom Hooper (The King’s Speech, Les Miserables) will lead as director and helm the first two episodes with Dawn Shadforth (Danny Boyle’s Trust, Kylie Minogue’s Can’t Get You Out of My Head) directing episode three and Otto Bathurst (Robin Hood , Peaky Blinders) directing four and five, with other directors to be announced. Dan McCulloch (Victoria, Endeavour) is Executive Producer and Laurie Borg (Peaky Blinders, Black Mirror) is Producer. The design team is led by Joel Collins (Black Mirror, The Hitchhiker’s Guide to the Galaxy) who said, "I wanted to be part of a show that would challenge every bone in my body. I was looking for something that would be a true test of my mettle. The hardest thing in fantasy is trying to show a mass group of people what they’ve only previously seen in their minds.” He is joined on the creative team by costumes designer Caroline McCall (Downton Abbey, Hyde Park on Hudson) and hair and make-up design being led by Pamela Haddock (The Terror, Sherlock). Director of Photography for block one is Justin Brown (The End of the F***ing World, Sixteen) and casting director is Kathleen Crawford (I, Daniel Blake, Filth). Framestore takes the role of VFX creative partner on the show and Michelle Martin, Head of Television, Framestore was excited about the opportunity, calling it "a televisual event of truly epic proportion." She added, "It’s a hugely ambitious project, but one we at Framestore take on confidently, knowing our award-winning teams will successfully see it through." His Dark Materials is produced by Bad Wolf and New Line Cinema, in its first foray into British television for BBC One in association with BBC Studios Distribution and Anton Capital Entertainment, S.C.A. The series will be filmed in Cardiff at Wolf Studios Wales.